1) USE YOUR BRAIN TOO! Many people call with questions about how to pick a puppy from a litter. Assuming you have already decided on a particular breeder, in today’s blog article, I’d like to give you a quick set of crib notes on what to look for when picking a puppy. Remember, you have to have a clear plan prior to visiting any puppies. If you don’t have a set of criteria and a clear way to assess them, you’ll likely come home with the first puppy you spend any amount of time with. Sometimes this “love at first sight” game plan works, but frequently, it results in spending many more hours training and coping with traits you never intended to have in your puppy. IMPORTANT NOTE: If you can swing it, visit several times to get the broadest sample of observations that you can. The raw material that goes into making your puppy is walking around right now. Set an appointment to meet the parents. I probably don’t have to tell you what to look for: If you like the look, health, and demeanor (particularly their energy level and their ability to settle down after being stimulated) of the parents then the next step is to see what kind of puppies they’ve produced in the past. Also, make sure that certificates are present for those parents having been tested negative for any of the particular maladies that your specific breed is known for. 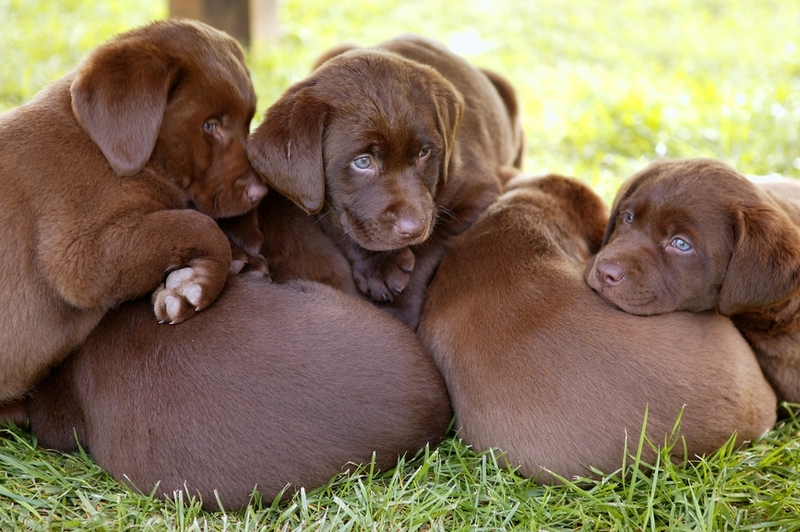 Often breeders will keep high quality pups in their own program, and will have them on the property for you to visit. Certainly, meet those pups that the breeder has kept but, additionally, get a list of people in your area that have pups from a previous litter. See as many as you can because pups, even siblings from the same litter, can vary quite a bit. The puppies environment, including: the yard they play in, the pen they spend much of their time in, and the household they are being socialized in should be clean and well taken care of. There should be no persistent smells or clutter around any of the puppy areas. The bathroom area for the adult dogs, as well as the puppy pen, should be clean and free of any waste. Essentially, the behavioral assessment of any puppy primarily falls into the old “kindergarten” report card category of – “plays nicely with others” (both canine and human). Your assessment of your particular puppy that you’re considering will be an abridged version of the 7 week puppy aptitude test that many breeders do. You can ask the breeder for their results and then do your own assessment to double check their findings. How Do the Puppies Interact with Each Other? Pup understands the “I give up” yelp that litter mate’s give when something hurts or is too much for them? Does the puppy seems to like interacting with people? Stand a few feet away from the pup, crouch down and call the puppy making clucking sounds. Does puppy come over to you? A pup should like investigating you and being interacted with people, balanced with a desire to go back and play with litter mates. If puppy hides a lot or slinks into corners, many of us have a tendency to want to “save” that puppy by choosing him or her. The puppy’s reticence to interact with you or the other puppies may be a big red flag for behavior issues later in life. Many people fawningly say, “My puppy picked me!” They’re experience is that, when they first approach the puppy pen, one puppy comes charging up to the fence and leaps up to make contact at the top of the gate. People sometimes see this as “love at first sight”, when in actuality, it’s a demonstration of that puppy, being the most dominant puppy in the litter, venturing out to see if you’re OK. I hear this “puppy found me” story line a lot after a dog grows up and is more dominant and willful than average later. So, be sure you’re assessing the behavioral characteristics accurately when visiting with the puppy you’re considering. To test this, pick the pup up and cradle him or her like a baby(some people like cradling a pup upside down to assess a willingness to be put in a vulnerable position) While holding them, handle them gently and slightly restrict their movement if the wiggle around. Handle their face, paws, ears, tail etc. A balanced puppy should accept a good amount of handling before protesting and communicating that they want to be put down. Does the pup understand how to limit their biting? This trait, that is, the ability to recover in the their nervous system after being over stimulated by sight or sound, may be the best predictors of having a solid and well balanced dog. It may be obvious, but you’re looking for category 3 – the recovers and investigates option. One of the “biggies” in behavioral traits is resource guarding. It’s a tough trait to train out of a dog. It can be done in many instances with hard work, but many owners tell me that they are so surprised by the intensity of the aggressive display from their dog in these situations that even when they seem “better”, the thought of risking another snap or bite is frequently too much for many owners to put up with. Now, let me be clear, many dogs will place their chin over a chew toy, or put a paw on something they’re playing with, to mildly indicate that they don’t want you to take it. However, once you follow through with taking the object away, they acquiesce and move onto something else. That’s not what I mean by resource guarding. Resource guarding behavior escalates fast and is intense. How bad is the guarding? The Ideal: the puppy simply allows you to remove the object of interest and gives no indication that they will protest your action. Mild Protest: The pup blocks you from taking the object. As mentioned earlier, the pup may place a paw or cover the resource with their chin. If you proceed to take the object with no reaction or increased resistance then it’s a yellow flag but you’re probably OK. The More Persistent Protest: As you attempt to take the object, and the pup, stiffens or looks, unblinkingly, directly at you, while physically blocking the object from you (if you don’t have gloves on at this point – get them – you’re likely going to want them). Slowly move your hand in towards the object, and gently but firmly begin to put pressure on the sides of the pup’s mouth (as if to move their mouth and head away from blocking the object). One of two things will occur here: i) the pup will re-grab the object and attempt to hold onto it in a more obvious attempt to keep it (this may include some growling) or you will see intense resource guarding behavior. This is often described as “flipping a switch”. 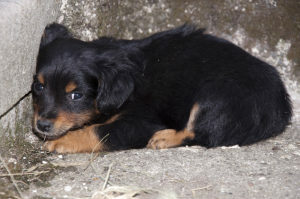 The pup will explode in a sudden display that often consists of a snarl, a bite, and snarling with lip curling and a deep growl. This is clearly a red flag and needs to be considered seriously as a disqualifying characteristic for taking a puppy home. Hopefully, this gives you a good “cheat sheet’ to go by when doing research for your next pup. Feel free to comment and drop me an email with any questions. Good luck in your puppy search.